The Bank of Japan has put its “yield-curve control” plan into practice. On Nov. 17 the central bank offered to buy shorter-dated bonds in unlimited amounts, the first time it has wielded the tools it introduced two months ago. This episode hasn’t cost the BOJ anything, because the bank offered below-market prices that nobody took up. Even so, it shows how the revamped framework aims to shield Japan from rising global yields. 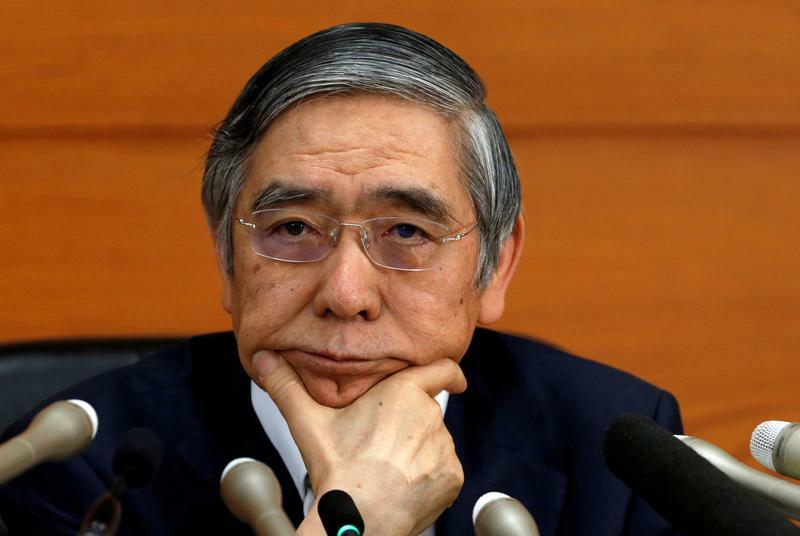 The BOJ’s new regime wants the ten-year bond yield to stay around zero, supporting an existing super-easy policy of “quantitative and qualitative easing”, as Governor Haruhiko Kuroda seeks to generate sustainable, healthy inflation. So the BOJ will still keep short-term interest rates very low or negative, and buy about 80 trillion yen ($723 billion) of bonds a year. However, Donald Trump’s U.S. election victory last week stoked expectations of a loosening of public purse strings, leading to generally higher growth and inflation. That sparked a sell-off in Treasuries, dragging down prices and lifting yields for Japanese Government Bonds. This presents an early test of the BOJ’s strategy overhaul. Thursday’s use of unlimited, fixed-rate purchases set a ceiling on shorter-dated yields. The BOJ offered to buy current 2- and 5-year bonds at 9 and 4 basis points below zero respectively, showing an unexpected willingness to micromanage the yield curve. No bonds changed hands. 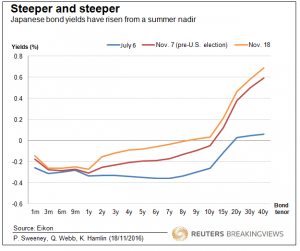 But if Treasuries continue to rise, investors are likely to test the BOJ’s appetite more thoroughly. If benchmark U.S. yields, already above 2.3 percent, keep rising, the BOJ may have to buy whatever the market throws at it if it wants to keep JGB yields steady. In theory the bank could see its already huge balance sheet swell uncontrollably – although given so many bonds are already in the BOJ’s vaults or held by institutions who cannot sell, it is an open question how much trading would actually occur. The commitment to free 10-year money could also let Shinzo Abe’s government borrow and spend more freely, despite Japan’s already high debt level. The Bank of Japan on Nov. 17 offered to buy unlimited bonds for the first time under a revamped policy framework, as debt yields surged in the wake of Donald Trump's U.S. election victory. BOJ Governor Haruhiko Kuroda said the central bank will not stand idly by as Japanese government bond yields jumped in sympathy with moves in U.S. Treasuries. The BOJ offered to buy an unlimited amount of bonds at minus 0.04 percent in the five-year JGB notes and minus 0.09 percent in the two-year paper, employing a method the bank unveiled in September to achieve its new policy to control the entire yield curve, rather than just short-term interest rates. The five-year JGB yield fell back to minus 0.095 percent from minus 0.065 percent. The two-year yield fell to minus 0.150 percent, down 4.0 basis points on the day. The BOJ's bond-buy offer has attracted no bids so far, as market players can sell such bonds at lower yields, or higher prices, in the market.